This printable set can be used for story time, for small "parties," at home, child care centers and preschools in any other related theme. The sets are available in color or black and white so the children can color and decorate them. 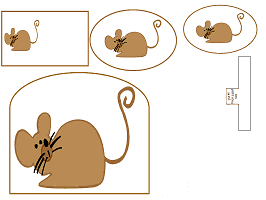 This set complements presentations for the following animal activities > G is for Gerbil, M is for Mouse, R is for Rat or adapt to a language of your choice. Here is a description of the items and suggestions on how to use them. The items on the activity set are labeled #1 to #4 . Here is a description of the items and suggestions on how to use them. Felt board character: Attach a small piece of sand paper to the back to use on a felt board. Optional: laminate for durability. Hand puppet: glue or tape a wooden craft stick or unsharpened pencil to the back. Large stand-up figure: Glue or tape against a toilet paper tube. Party bag: paste to a standard lunch bagand fill with the other activities. Example > divide a group of children and have half of the group wear the mouse name tag and the other half the lion name tag for The Lion and the Mouse fable. Each group will dramatize the lion actions, roar and the mice will squeak and play the part of the mouse. A small piece of masking tape works well to attach to clothing. Mini flash card: Write the animals name or beginning letter: lion or mouse in your language and use on the flannel board or have each child wear one. Ideas: The same activity mentioned above can be conducted and the cards will focus the children on the printed words. Small stand-up figure: cut a 4"-5" inch x 1" inch strip of card stock to form a tube and tape or glue to the back of the image. Paper cup sticker & scrapbook: tape to a standard paper cup for snack time fun or use on a scrapbook. Finger puppet: Glue the small oval to the middle of finger strip. Wrap around index finger to fit, cut excess paper and tape in place. Pencil topper decoration: Use hole puncher on the top and bottom of the oval, insert pencil through bottom front hole, slide up to the top hole, adjust at the top of the pencil. Place a small piece of tape on the back.